After my exciting, near death experience in the Grand Canyon, I really had to think about if I wanted to continue on with our plans to do some hiking in Zion 2 days later. Honestly, I was scared. And because I was scared, I knew I had to do it. I knew if I let the fear take over, it would cripple me. I did have thoughts going through my head that I just need to quit running and hiking, and just stay inside where it's safe. I knew the only way to shut up those voices was to just do it. So that's what we did. The views were unbelievable! So stunning. We hiked a total of 5 miles, on a few trails. Our hike went great. I was disappointed we couldn't go on any 'difficult' hikes, but I knew I had to be smart about it. I was not going to take any chances. After our hike Kristy took me to a restaurant that she's been to many times, Wildcat Willie's. It was sooo good! We had a great hike, and I'm so glad we still went. I've been home now for a little over a week, and haven't done any running yet. But that will change tomorrow; I'm going for a run! Again, I'm a little nervous. (The dr said I'm more susceptible to heat exhaustion again now that this has happened.) But I'll keep my water with me and be very careful. This will not stop me from doing what I love! 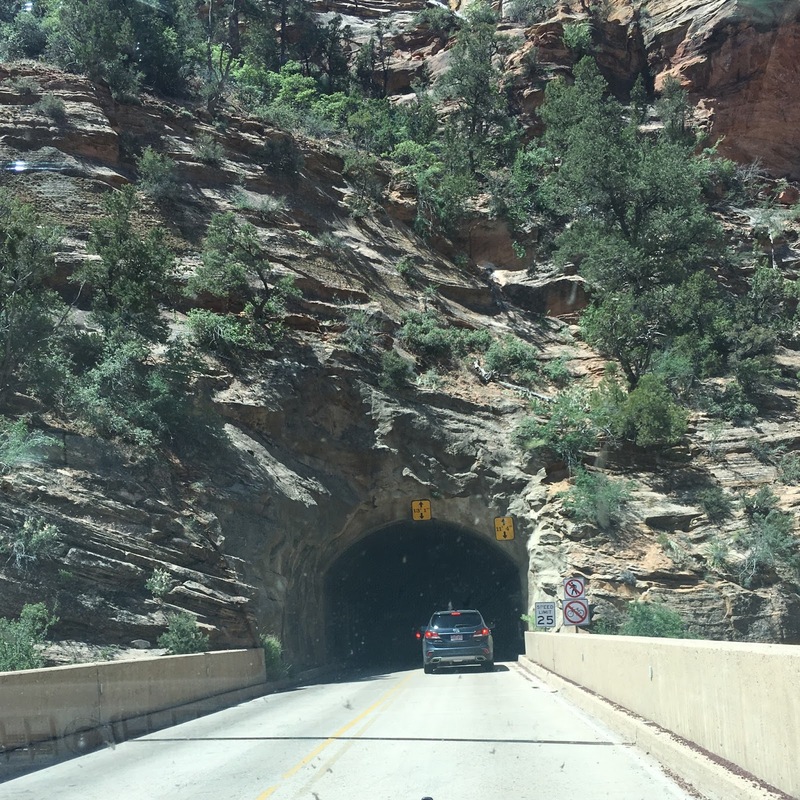 My rim to rim to rim adventure didn't go quite as expected… but let's start at the beginning. 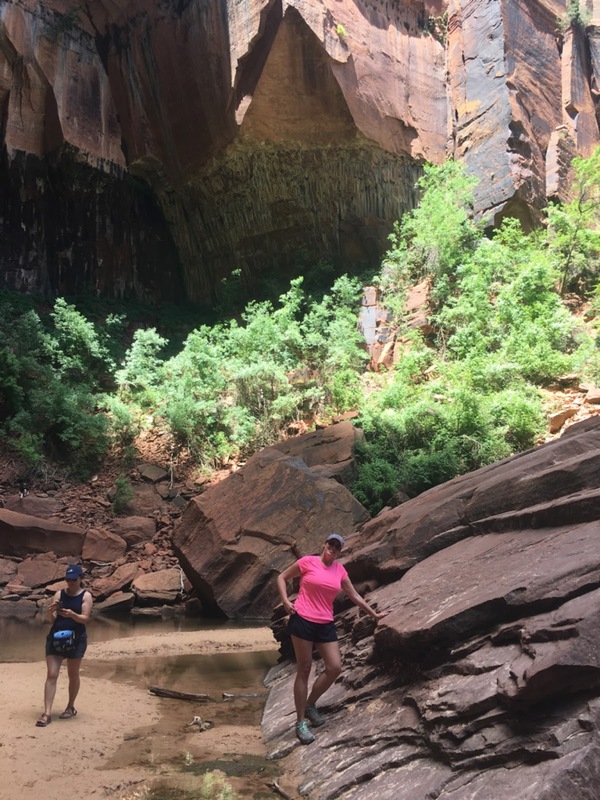 6 months ago Kristy posted about how hiking R2R2R was on her bucket list, and did anyone want to join her. Since I am always up for an adventure, especially if it includes something outdoors, and it's not easy, I said I DO!! So we trained and prepared for 6 months to be able to do this. (I was out for a couple months due to surgery, but trained every chance I got after I recovered) We were so excited about this! We got to the Grand Canyon on Thursday afternoon. We checked into our campground and got our tent set up. After that we set out to see the Grand Canyon. It was even more stunning than I had imagined. It is so, so vast. Everywhere you look, there's more of it. It truly is breathtaking. After walking around for a while, we ate dinner at the lodge. Spectacular views! We went to bed early, 4 AM would be here before we knew it. I got so cold that night. I was wearing a T-shirt, a sweatshirt, sweatpants, hat, gloves and handwarmers. And I was still shivering most of the night! I believe the temps were in the upper 40's. I did think about how in just a few hours I would be in 100 degree temps though! About 2 miles into our hike one of the straps on my backpack broke. My foot just slipped a little bit and when I reached out to catch myself, it pulled on the strap and it broke. We tied it together with my bandana, but it was never quite the same after that. The rest of the hike the majority of the weight was on my right shoulder. The first 13 miles were mostly downhill. It hadn't got unbearably hot, I was feeling really good. The only thing really bothering me was my pack. Kristy ended up taking one of my water bladders, so I wouldn't have so much weight. Which meant my pack was now around 15 lbs and hers was close to 40. She's a beast! And such a sweet friend. That really helped me out a lot. We reached Phantom Ranch campground after 13 miles and took a little break. Kristy had looked this place up online and saw that they had lemonade in the little store there. I cannot tell you how much we were looking forward to that lemonade! And it did not disappoint. Best lemonade I've ever had. It tasted so good! I knew once we left Phantom Ranch it would get more difficult. We had 13 or so miles left and they were straight up to the south rim, it was also now the hottest part of the day. I had no doubt I could do it though. Physically I felt fine, my legs weren't even sore, but I was tired. Mentally I was in a good place. I was positive, I kept telling myself I can do this, and things like that. It was brutal, the heat was insane (105), no shade whatsoever. I felt like I was taking a few steps and then stopping to rest. I was feeling so bad for Kristy, knowing I was holding her back. But I knew I was giving it my all. It really was the hardest thing I've ever done. It felt like I was walking through hell. A beautiful hell. Ha! I remember thinking I wish I could sit down by this rock and rest. But I knew if I did I would die there because I would never get back up. So that was not an option. I just kept saying I can do this, I've trained for it, I've got this! The next thing I knew, I was struggling to open my eyes, and I was laying on the ground. I KNEW I was dreaming. I just knew it! When I opened my eyes there were two ladies with me. One was sitting right beside me, and the other one was standing over me fanning me with a shirt. I kept asking them if they were angels, they just smiled. Kristy filled me in on all the details and said how she noticed right away something wasn't right with me. I was stumbling and couldn't answer any of her questions (we had just been chatting normally). She sat me down and I was telling her to just leave me, just let me go, just let me go. Then I told her to just put me in my house. She did whatever she could to keep me awake. But then I slumped over, and my face and lips went white. She said my skin was drying out quickly. Right then 2 women hikers just happened to be walking towards us. Kristy knew she had to get me to shade, and there was some just a little ways up. Somehow they managed to stand me up and push me up the hill into the shade. She begged the two women to please stay with me while she went to get help. She had taken some EMT training in college, and one thing they did was learn how to help people with heat exhaustion. I could not have been hiking with a better person, no doubt about that. So she told them what to do, while she ran 2 miles back to the emergency phone. When I woke up I kept telling myself to wake up from this dream, it was the craziest feeling I've ever had. I just knew this was a dream that I would wake up from. The girl sitting next to me kept me talking, and from going back to sleep. I knew I was with a friend, but I couldn't even remember her name. It was driving me crazy that I couldn't remember those things. I would try to talk and couldn't even get the whole sentence out, because my brain couldn't get the words to my mouth. My brain was total mush. I kept asking her if I was paralyzed, because I told her I had to run again! I was also so worried that my brain wouldn't return to normal. She assured me I was not paralyzed and that I would be fine. I remember being so mad that I passed out. I only had 7 miles to go! I was so mad at myself. I could tell the two girls helping me were foreign, so I asked the one sitting beside me where she was from. She told me she was from India. Well, that got me crying. I told her I was once going to adopt a baby girl from India. Oh, I was such a mess! It was funny the things I could remember, but then the things that I should remember, I wasn't able to. I remember seeing a group of hikers coming up to us. One of them was an ER nurse, and she actually had an IV with her! What a miracle! That absolutely saved my life. Meanwhile, Kristy had reached the phone in 28 minutes (which was another miracle, it took her an hour and a half to get back to me. No doubt God helped her get there quick), told the Ranger exactly where I was so they could get help to me. Betsy, the park ranger was 1 mile away from me. She also had an IV with her which I needed as well. She was so sweet and comforting too. She later told me she wished she had recorded me on her phone, because I was so funny. I can only imagine! I know I was so out of it. She asked me some questions, some I knew, some I didn't. I totally butchered my last name as I was trying to spell it for her. I was very wobbly, my shoes felt like they were stuck in mud. I could not get them to move. So I sat back down for a little while longer. Around that time Kristy came back. I overheard someone ask her name, and when she said it then I remembered. She said I was just holding onto her hand and I kept telling her I remember you, I remember you. I was so happy. A few minutes later the helicopter arrived and they helped me walk to it. I have always wanted to ride in a helicopter, especially over the Grand Canyon! Although that's not exactly how I thought it would happen. I really wish I had my phone with me at that point so I could've taken pictures. Words can't describe the beauty that I saw. Of course I was also looking through new eyes, thankful that I was alive. After we landed I was taken by ambulance to the Grand Canyon clinic. I was there for about an hour getting fluids. I asked her what her average marathon time is and she said 2:40. Amazing!!! Meeting her was definitely a highlight of this whole experience. When I got into the helicopter, Kristy was able to finish the hike to the south rim. She ended up with 30 miles that day, on raw feet, covered in blisters. She had gotten them wet as she was running for help for me, which is why they got so bad. Betsy let me stay in her apartment for the night, which was so incredibly sweet of her. Then Kristy got there on Saturday after hiking 7 more miles, and we stayed that night there too. Sunday we (miraculously) were able to get seats on the shuttle for the 5 hour ride back to the North rim, to her car. I feel like there are so many details I'm leaving out, but I know this is long enough already. So many miracles happened that Friday afternoon. The biggest being that I was in stage 3 heat exhaustion, with stage 4 being death, and I was moments away. I found out that my nutrition and hydration were good. I was only slightly dehydrated because in the last 2 miles I quit drinking much water. It was solely due to the heat, and my body couldn't take it. I know if Kristy hadn't done everything she did for me, I have no doubt, I would not be here right now. She absolutely saved my life. I am so thankful to the two Indian girls who helped me, the hiking ER nurse who gave me an IV, for Betsy the park ranger, and every other person who played a part in my rescue. I am most thankful to God, who knew everything that was going to happen and He put every single person in place at the perfect time to help me. I just feel overwhelmed with gratitude. Facing death, knowing you were minutes away, and surviving; it changes you. Tomorrow I'll write about our hike in Zion National on Monday. Yes, I hiked again.